The Residence offers fully furnished studios with internet, Private kitchen with all furnishings, en-suite bathrooms, 24/7 security, laundry and services, 24/7 gym, study spaces with free-to-use apple computers, friendly staff and modern common spaces. Highbury II is a brand-new property based in North London, directly next to Holloway Road underground station and nearby Finsbury Park and Arsenal. Famous for its Georgian architecture and green spaces, Highbury is an absolutely charming place to live, just 10 minutes from the centre of the capital. Excellent transport links to the commercial hubs in the City, it mainly attracts students and young professionals creating a friendly, laid back atmosphere which you’ll love. With its many established theatres and exciting music venues, it is an interesting and artistic area filled with world class restaurants and cute cafes, so you’re never short of cool places to go with friends. Exploring other parts of London is easy to do as it’s only 10 minutes from the city centre via the Piccadilly line. Approx. 15 minutes via the tube. Walk 1 minute to Holloway road and get Piccadilly Line to King cross and then change to the Victoria Line 1 stop to Euston. Exit Euston station and get off on Eversholt Street, cross over the road and EC School is straight ahead (Euston House). Take the Piccadilly Line direct from Heathrow station to Holloway road station. Chapter Highbury II is next door to Holloway road station. Take the Gatwick Express to Victoria train station. Make your way to Victoria underground station and take the Victoria Line to Kings Cross and change to the Piccadilly Line to Holloway road station. Chapter Highbury II is next door to Holloway road station. From Stanstead, take the Stanstead Express to Tottenham Hale, where you will change to the Victoria Line to Finsbury Park where you will change to the Piccadilly Line to Holloway road. 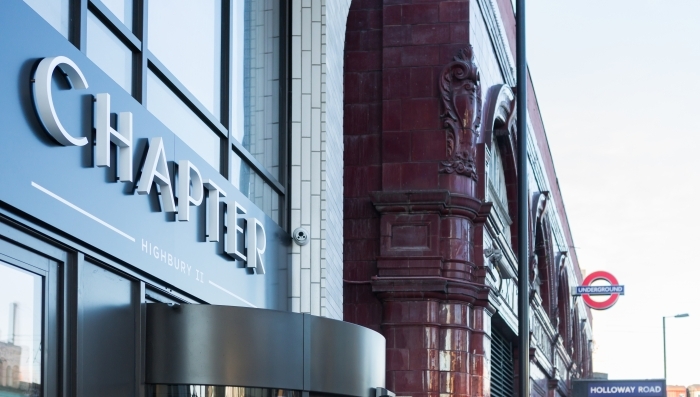 Chapter Highbury II is next door to Holloway road station. EC must be notified of student arrival arrangements and expected times of arrival. Smoking is not permitted in the residence. Students will complete an Authorisation for Residence Disclaimer form on the first day of school. No credit card or bank details are required. The residents use their own room access card that they top up online after registering on the UpayChilly website. On check in they receive detailed information how to register and top up, they can also ask the reception to help them set up.